Find and open any file in your solution using a simple dialog and a few search tokens. The example finds filenames with "player" and "swim", without "multi", and opens the selected file at line 1024. In a dialog that supports similar filtering, find any symbol in your solution. To become a power user, explore the context menu in this and every dialog of Visual Assist. Despite comparable functionality in Visual Studio, many users rely on Visual Assist to find more definitions and declarations than built-in Intellisense. Alt+G opens a menu when multiple targets are available. The big brother of Alt+G can take you just about anywhere related to the current symbol. Instead of chasing an implementation with successive presses of Alt+G, use Shift+Alt+G to jump into a hierarchy. From any reference to a class, jump directly to a base or derived class. Open the file that is most related to the active document. In C/C++, Alt+O typically opens a corresponding header or source file. Alt+O opens a menu when more than one destination is possible. Follow Alt+O with Alt+Left-Arrow to return to your original destination. Although built-in Find References has improved over the years, the version in Visual Assist is still faster, more powerful, and often more complete. 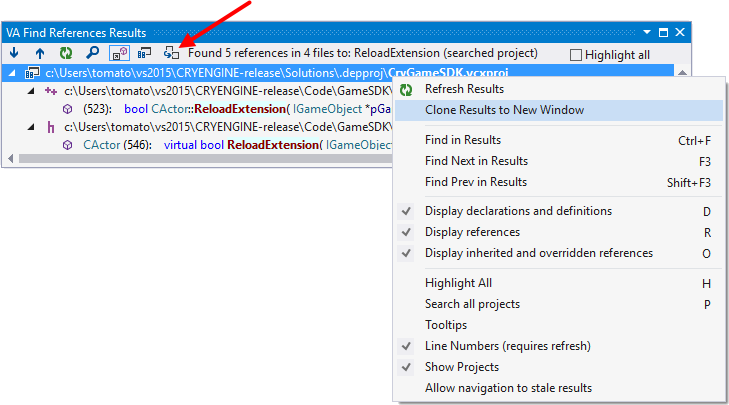 Clone results windows, via icon or context menu, so you can run additional finds without overwriting your initial results. Access the features of Visual Assist applicable to the current context with Shift+Alt+Q. The content of the menu varies greatly. Experiment from symbols of different types, expressions, lines, and whitespace. 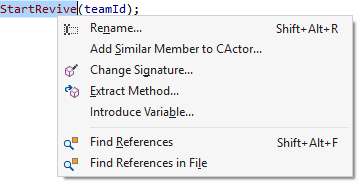 Adjust spacing and format of the VA Snippets used by the refactoring and code-generation commands in the menu, e.g. Create from Usage and Implement Virtual Methods. Open the snippet editor via VAssistX | Tools | Edit VA Snippets, then set type to Refactoring. Disable the floating buttons that open the same menu as Shift+Alt+Q. Navigate the current file from a simple drop-down of classes and methods in it. Filter the list using substrings. Adjust content of the list via the context menu for the tiny down-arrow. Although built-in Rename is occasionally sufficient, the version in Visual Assist is faster, more powerful, and often more complete. Rename the definition and declaration of a symbol, all references to it, and optionally, occurrences in comments and strings. A preview of all targets to be renamed is always shown so you are confident the rename does what you expect. Add hashtags to comments and navigate among them via tool window (Shift+Alt+H) or go-to command (Shift+Alt+G). VA Hashtags are effectively bookmarks and tasks that move with your code. Create new hashtags or prepend # to existing keywords, e.g. #John and #TODO. After you navigate using simple VA Hashtags, learn about their advanced functionality.